Perhaps the most well recognised and well renowned over-sized watch, is the Audemars Piguet Royal Oak. The Royal Oak was first produced in 1972, almost a century after Jules Louis Audemars and Edward Auguste Piguet formed the company, and quickly became the makers most popular model. Gerald Getna, already behind such iconic models as the Omega Constellation and Patek Philippe’s Golden Ellipse, was given the task of designing the Royal Oak. The designer is believed to have taken inspiration from two different nautical muses. Upon seeing a diving crew preparing to submerge, Getna noticed that the helmet was secured to the suit by a number of screws. He figured that if this made the diving suit watertight; the same principal could be used for watches. The result was an octagonal bezel fitted with 8 hexagonal screws, giving the Royal Oak its distinctive look. The watch is also thought to be inspired by a series of British Naval battleships, from which it took title Royal Oak. The HMS Royal Oak, built in 1862, is thought to be the biggest influence on the design, featuring octagonal gun ports which were secured by 8 bolts. 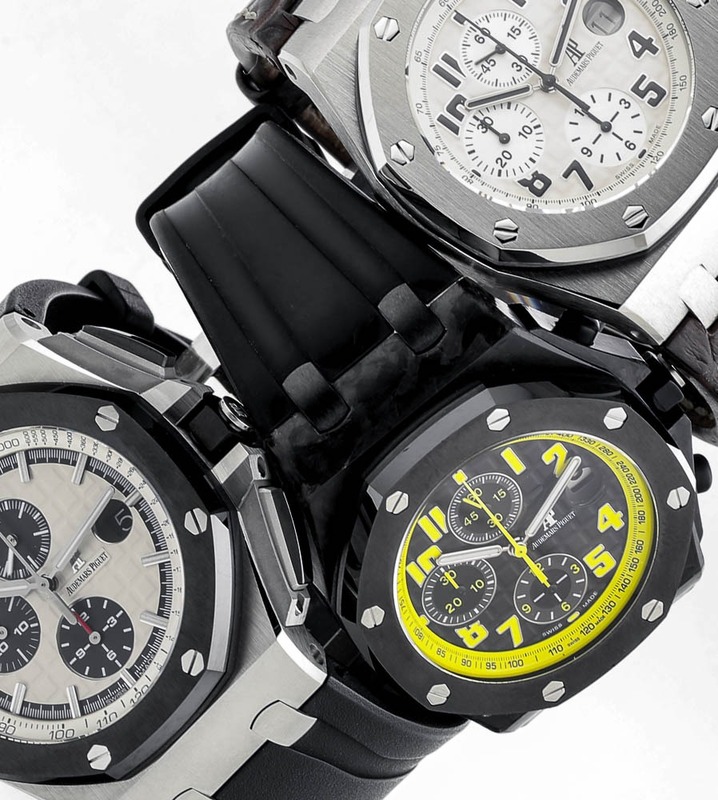 The Audemars Piguet Royal Oak Offshore was launched in 1992 to commemorate the 20th anniversary of the Royal Oak. Its 42mm case made it the first oversized luxury watch, and it went on to become the most popular of the Royal Oak variations, spawning many different special editions often manufactured in limited numbers. 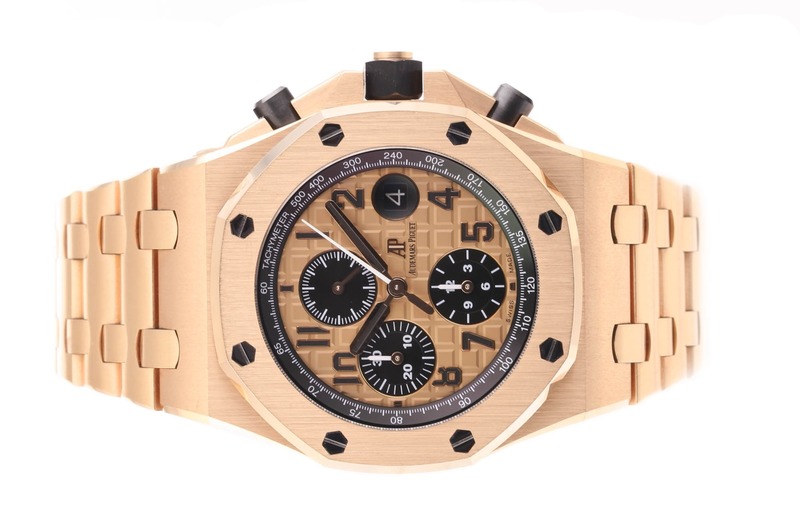 Amongst these a strong Formula 1 connection has seen Audemars Piguet release the Ref 26568OM.OO.A004CA.01 ‘Schumacher’ model, as well as one designed for fellow F1 driver Rubens Barrichello. Other well-known sporting legends have lent their names to Offshore models including India’s all team leading run scorer Sachin Tendulkar. Another, reference 26133ST. 00.A101CR.01, commemorates the career of Olympic Gold Medal winning and NBA Hall of fame inductee, Basketball legend Shaquille O’Neal. Featuring the rare inverting of the 2 and 3 on the bezel in red, to reference his playing jersey number 32. The case back is engraved with a silhouette of ‘Shaq’ making a slam dunk, to finish off this truly special edition. The most striking part of the Offshore model often comes from intricately produced Tapisserie dial. In 3 distinct sizes; ‘Vintage Petite’, ‘Petite’ and ‘Grande’, the dials are made up of etched, raised squares which cover the whole of the dial in a uniform pattern, with each dial taking between 20 and 50 minutes to be mechanically produced. The nod to nautical history makes the Audemars Piguet Royal Oak Offshore a must buy for any Naval history enthusiasts, and the sporting pedigree of those honoured by the special edition models merely adds to appeal of the Royal Oak Offshore. In addition to this the watch still has huge appeal for those in awe of skilfully created timepieces.